The bindery consists of a small team of highly skilled craftsmen, all dedicated to the sympathetic and appropriate treatment of books. The Bindery uses the very latest techniques, mostly developed in-house, for everything from the attachment of book boards to the flattening of vellum manuscript leaves. James apprenticed as a Finisher for 6 years at Blackwells Bindery in Oxford and then studied under Ivor Robinson for four years. From 1968 -1973 he worked as an assistant to Sydney Cockerell in Cambridge. In 1973 James started the Eddington Bindery for The Lord and Lady Fermoy, and managed it until 1976 when he set up his own bindery in Oxford. From 1982 – 1983 he was the University of Wales Arts Fellow at The Gregynog Press and Bindery. From 1985-87 he was the President of Designer Bookbinders and then 2001-05 he was President of The Society of Bookbinders. In 1999 he was awarded accreditation by The Institute of Paper Conservators. James has written many articles on bookbinding technique and has given numerous lectures and workshops in Britain, Europe, the USA and Australia. James invented the Concave spine and previous works include two Electronic bindings, commissions for The British Library and The Victoria and Albert Museum and has bindings in private and national collections worldwide. In 2013 James was a judge for the Designer Bookbinders International Competition. Stuart graduated with an Honours Degree in Mechanical Engineering from Imperial College, London before joining the bindery fulltime in 1995. In 1999 he was elected a Licentiate of Designer Bookbinders and then a Fellow in 2004. Stuart has Modern Fine Bindings in a wide range of private collections worldwide and also in The British Library and The National Library of Scotland. He has completed many commissions from collectors and has exhibited his work at a wide range of venues including Flow Gallery, London, ABA bookfairs and the Bodleian Library, Oxford in the UK and at a range of venues in the Europe and the USA including Chicago Public Library, Boston Library and the Grolier Club, New York. Stuart has given workshops and has lectured in the UK, USA, Canada, Iceland and Finland. He has been a speaker at various Society of Bookbinders’ conferences, training seminars and regional events in a range of topics. During 2000 Stuart set up and ran a bindery in Chile, where he has subsequently made visits to work on a private collection. Stuart organised the Society of Bookbinders International Biennial Competition for eight years up until 2009. He was a judge at the fourth De Goyler Bookbinding Competition, Bridwell Library, Texas, USA, January 2007, and has been a judge for the DB annual Bookbinding competition. 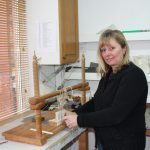 Jackie has worked for the business since 2003 and specialises in paper repair, sewing, vellum flattening, endbands and box making. Louise has worked fulltime for the business since 2002. Prior to this date she was a Secondary School Science teacher. Louise makes marbled paper in her own workshop and is responsible for the day to day running of the admin side of the business.